Chelsea were able to triumph over Manchester United 1-0 at Wembley to secure the 2017/18 FA Cup title. The London side saw through the victory courtesy of a first-half penalty from Eden Hazard, which the Belgian won after driving through a foul from Phil Jones inside the box. This will be some much-needed respite for Chelsea, whose title defending season was awful and saw them settle for a 5th place finished and be bereft of Champions League football next season. However, it remains to be seen whether Antonio Conte will be kept on despite securing the trophy. 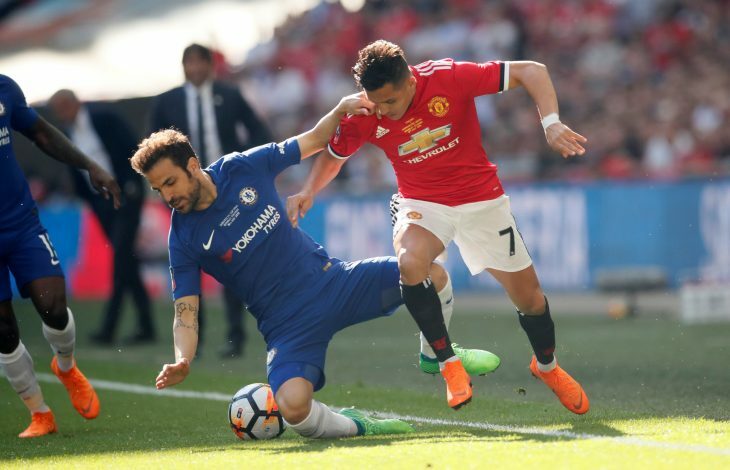 The fixture was a game of two halves, as Chelsea, who had more or less kept their own quite well in the first half were repeatedly beaten by United in the second, but managed to carry on their one-goal advantage quite well. Cesc Fabregas, in particular, gave a mixed performance in the second-half, but it doesn’t change his contribution, which was providing the ball that eventually ensured Hazard’s early and well-timed run and the consequent match-winning penalty. Man Utd To Complete First Summer Signing Within 24 Hours? It wouldn’t have been uncommon for the victors to gloat over their win and celebrate pompously, but the Spaniard did something else. Immediately after the full-time whistle, the 31-year-old did something remarkable. A truly classy gesture by the former Barcelona star and one that defines the more noble nature of the game and the character of the player. Jose Mourinho is bound to be disappointed with the end result, as he is not a man to go a season without a trophy to his name. But perhaps the season will cause the gaffer to do some introspection and truly drive a result-based transfer window to ensure success next season.